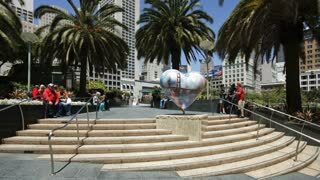 Search Results for "san francisco people"
SAN FRANCISCO - Circa October, 2015 - People walk on The Embarcadero in San Francisco. SAN FRANCISCO - Circa October, 2016 - People and traffic travel around the Ferry Building on The Embarcadero in San Francisco on an Autumn evening. SAN FRANCISCO, CA - Circa October, 2016 - People board a streetcar on The Embarcadero in San Francisco on a foggy morning. SAN FRANCISCO - Circa October, 2014 - Two people fill out forms to get a free HIV test outside on Castro Street in San Francisco. SAN FRANCISCO, CA - Circa October, 2016 - A MUNI light-rail train passes by people at Mission Dolores Park in San Francisco. San Francisco pier with people walking 4k. 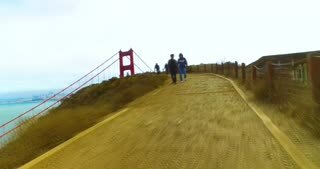 SAN FRANCISCO - Circa October, 2016 - A walking time lapse view of people visiting the Golden Gate Vista Point Overlook on a foggy overcast day. 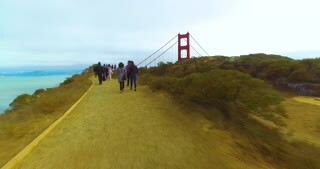 SAN FRANCISCO - Circa October, 2016 - A timelapse walking view of people visiting the Golden Gate Vista Point Overlook on a foggy overcast day. CALIFORNIA 1950s: People walk through China Town in San Francisco. Chinese people in San Francisco. Lady talks to customers. CALIFORNIA 1950s: view of San Francisco from sky. Golden Gate Bridge in San Francisco. 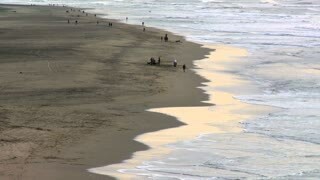 People play in waves at seaside. Boat travels across Bay. 1970s: San Francisco, people ride streetcar. Drawing of geothermal power plant, hot fluids from underground drive generators, create electricity, fluid is returned to the earth. 1900s: Cable cars, cars, horse drawn carriages travel around ferry building in San Francisco. People stand against building. San Francisco, United States, June 12 2018: People and tourists traveling on cable car in San Francisco. The San Francisco cable car system is the world's last manually operated cable car system. San Francisco, California, United States - August 14, 2016: people at Fisherman's Wharf at Pier 39 along the Embarcadero. San Francisco cityscape. 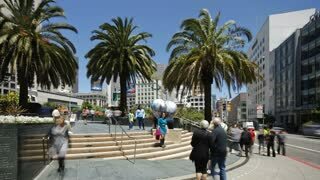 American travel in San Francisco. 1970s: Sun shines, steam rises from geyser surrounded by water. 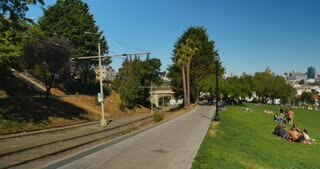 San Francisco hills, people ride streetcar, large buildings, band plays music. SAN FRANCISCO 1970s ? People pass through an archway to leave the campus of school grounds. 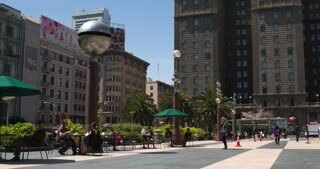 View through sky scrapers in San Francisco as people walk past.